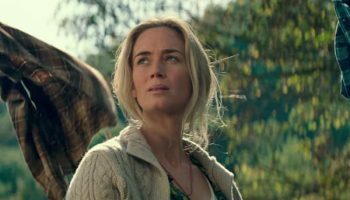 ‘A Quiet Place’ Review – Spotlight Report "The Best Entertainment Website in Oz"
Thanks to Paramount Pictures we had the chance to see John Krasinskii’s, A QUIET PLACE before its official cinematic release. This is our review of the movie, but as usual, no matter what we say, we still recommend you to go and see it at your local cinema because there is no better critic than yourself! The horror genre has been in the midst of a renaissance over the last few years, following the success of movies like Get Out, which is as unnerving as it was terrifying. Leading this new breed in 2018, A QUIET PLACE has been billed as one of THE scariest movies in a generation. Holding a rare 99% rating on Rotten Tomatoes, the movie is Directed by and stars, John Krasinski, alongside his real life partner Emily Blunt. The movie tells the story of a family living in a post-apocalyptic world inhabited by creatures that hunt you by sound. It begins 89 days after the ‘event’, with the family scavenging through a pharmacy looking for drugs to help their son deal with an illness, while trying to remain silent. Every step, effort and breathe is a daunting undertaking and it’s not long before the audience is drawn into this mindset, daring not to breath allowed – let alone eat their popcorn. It’s an eerie notion (and feeling) that translates well on the screen, with the family communicating the entire time through sign language that they learned in order to communicate with their deaf daughter (played by Millicent Simmonds who is deaf in real life). They live their lives walking on sand and avoiding anything that could cause them to be detected. But if you’ve ever tried sneaking around the house late at night, bumping into everything and anything while hitting every creaking floorboard, terrified of stirring anyone sleeping nearby – then you’ll have some semblance of the terror this movie imparts of the viewer – at least for the most part. The family continues living a life that is as close to normal as can possibly be, mundane even – but they’re grateful to be alive and there’s something charming about this notion and the connection they have (that, or just the very thought of being disconnected maybe the appeal). 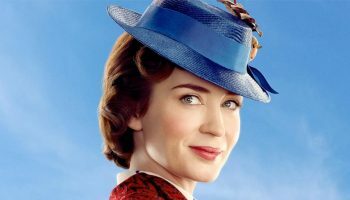 As the story develops, we find that Emily Blunt’s character is pregnant, and the movie plays well on the heightened fear of the situation that the family is in. How will they survive? How will she give birth without making a sound? And what will life be like in this inhospitable world with a newborn child? You’ll have to watch it to find out. And while A QUIET PLACE is well-crafted story that does not show its hand too early, apart from a startling scene at the beginning that sets a great tone, if only for a little time. What’s more remarkable is that this is only Krasinski’s second Directorial role and is worlds apart from his 2016 bitter-sweet comedy, The Hollars. The process of which was likely made easier having his real-life spouse, Emily Blunt, along with him for the ride. The movie does a great job of building up the tension, but it loses something when the creatures become more prevalent in the story. I was happy just watching the family try and survive the abhorrent situation they were in. Like The Road, the grit, determination and shear will to survive the bleakness is something I don’t mind enduring – dare I say…enjoying. But once the audience becomes more accustom to the invaders, the magic is lost. While there is no arguing it’s a well-acted, directed and shot movie – the story, which started so promisingly, descends into just another monster movie with a cheesy ending that leaves the viewer empty – unlike their popcorn bucket that they’ve been too terrified to eat throughout. 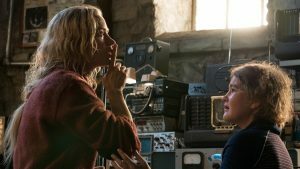 A QUIET PLACE – In cinemas now! 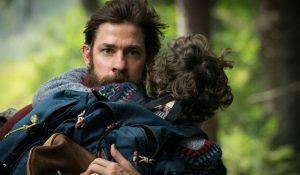 ‘A QUIET PLACE’ Brand New Trailer and John Krasinski Featurette!